CANTON, Mass. – The tournament has started early for Milford. The Hawks entered Monday afternoon’s game with Davenport rival Canton sitting on 10 losses and needing six wins in a row to try and qualify for the postseason. Milford got a little help from the Bulldogs to keep its playoff hopes alive, as seven Canton errors led to 10 unearned runs for the Hawks in a 14-6 victory. The Hawks lost a 5-0 lead and fell behind 6-5 in the fourth, but used a seven-run sixth inning (fueled in part by three errors) to break the game open. The visitors jumped out to a lead in the top of the first against Canton starter Sean Doyle. Alex Coady drew a one-out walk and scored on Aidan Wilde’s double to left center. Wilde was thrown out trying to stretch it into a triple. Blake Hill singled to continue the inning and after a walk, a fly ball to left off the bat of Anthony Arcudi was dropped allowing the Hawks to take a 2-0 lead and setting the tone for a tough day in the field for the Bulldogs. In the second, Milford added two more runs. Brian Ireland started the inning with a homer to right and a two-out walk to Coady would lead to another. Wilde was up next and was hit by a pitch and Hill drew a walk to load the bases. Zack Tamagni drew the inning’s third walk to earn an RBI. Coady would make it 5-0 in the third with a two-out fielder’s choice that scored Ireland, but Canton rallied in the bottom half of the inning. Joe Peccia drilled a two-run homer to right to get the Bulldogs on the board. In the fourth inning, Canton took its first lead. Kevin Monagle led off with a walk and Doyle followed with a single to right. After a wild pitch, Daniel Harnett hit into a fielder’s choice that scored one run, but Doyle got caught in a run down for the first out. Matt Cassamento and Mike McMahon both singled to load the bases and a wild pitch brought in the second run of the inning. Peccia added his third RBI of the game with a sacrifice fly to center to tie the game at 5-5 and when Griffin Jerrier’s grounder was not fielded cleanly, Canton took the lead. Another error led to another unearned run for Milford in the fifth and tied the game again. Canton had a chance to regain the lead in the bottom of the fifth after Hill walked Jim Jenkins and Monagle with no outs. Milford turned to junior Nate Irwin, who induced a 6-3 double play from Doyle and a pop up into shallow left for Wilde to track down and end the threat. Irwin would allow only one hit and two base runners in three scoreless innings of relief to pick up the win. The game was won in the sixth. Milford scored seven runs on three hits off Peccia, who took the mound in the fourth inning in relief of Doyle. Canton also made three errors in the inning, extending the at-bat for Milford and leading to 11 hitters coming to the plate in the frame. With one out, back-to-back errors and a hit batter loaded the bases. Irwin hit a grounder towards third, but the attempt to get the lead runner was bobbled allowing everyone to reach safely. Chris Speroni’s grounder also got away from a fielder to bring in a second run. Coady singled to left and it was 9-6 for the Hawks with the bases still loaded. Peccia struck out Wilde to get the second out, but he could not limit the damage, as Hill drilled a line drive double to right center that if not for the fence could still be traveling. The hit cleared the bases and Hill came home one batter later on a single by Tamagni. “He’s been really killing the ball this year,” said Pellegrini of Hill. “I haven’t seen someone who hits the ball as hard as him in a long time. Alex Macek doubled to start the seventh and would eventually score on a wild pitch to wrap ip the scoring for the Hawks (5-10, 5-9), who will need to win all five of their remaining games to earn a spot in the tournament. NORTH EASTON, Mass. 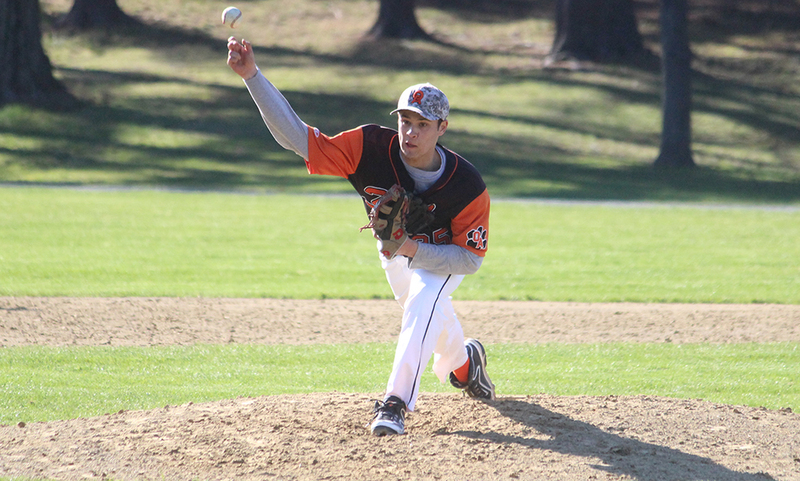 – Six solid innings from senior Zach Sato and a three run fifth inning helped Oliver Ames score its first win of the season with a 4-0 decision over Canton. 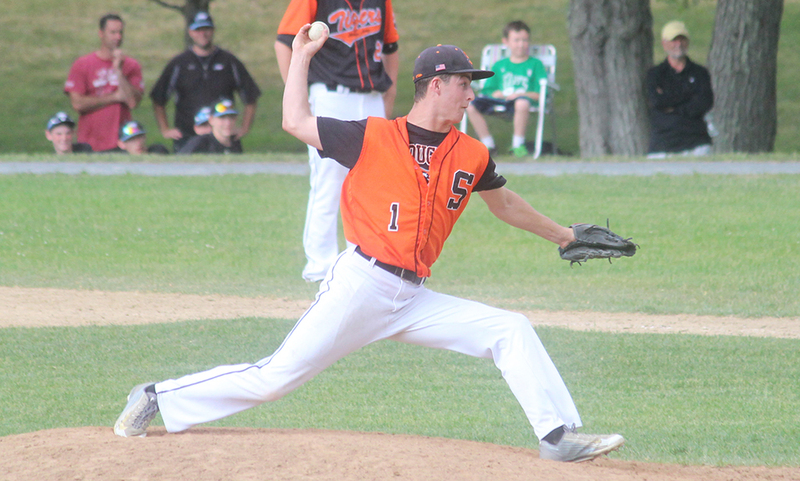 Oliver Ames took a 1-0 lead in the bottom of the third and then capitalized on a pair of Bulldogs’ errors in the fifth inning to tack on insurance runs. Sato tossed six innings in his second start of the season, striking out six batters, walking two and allowing just a pair of hits to get the win. Both Sato and Canton senior left hander Sean Doyle were efficient through the first two innings. Sato allowed a walk in the first inning but escaped without harm. After allowing a leadoff bunt single to Mike McMahon in the second, OA catcher Josh Minuskin threw him out at second on a steal attempt and Sato got two straight outs. Doyle let up a leadoff double but induced two ground balls to Powers at shortstop and ended the bottom of the first with a strikeout. Kevin Geary advanced to third after a leadoff single but Doyle induced a pop up to strand the runner. Sato needed just 10 pitches to get through the top of the third inning and OA used that momentum to cash in in the bottom half. Sophomore Matt Muir led off with a single up the left field line and moved to second on a sac bunt from Chris Romero. A wild pitch moved Muir up to third and senior Ryan Adams laced a shot down the right field line for an RBI triple to take the lead. After both sides went down in order in the the fourth, Oliver Ames added insurance in the bottom of the fifth. Matt Mancini started the inning with a four pitch walk and stole second. Doyle got two straight infield pop ups and looked like was going to get out of the inning unharmed but an error gave the Tigers life. Minuskin hit a grounder to third but the throw sailed over first to advance Mancini to third. Adams then found space in the right side to bring Mancini home and push Minuskin to third. A dropped pitched allowed Adams to move to second and Mitch Goulet walked to load the bases. Canton brought Joe Peccia in to pitch. Geary got contact on the first pitch and it rolled to short. But the throw for the out at second couldn’t be caught and both Minuskin and Adams came across the plate to make it 4-0. Sophomore Chris Perron made his varsity debut with a perfect 1-2-3 inning in the top of the seventh to earn the save. Adams finished 2-3 with two RBI and a run scored while Muir had two hits and Geary finished with one. McMahon and sophomore Matt Casamento each had a hit for the Bulldogs. Oliver Ames (1-3) will be back in action on Saturday when they travel to New Bedford for a 11:00AM non-league contest with the Whalers. Canton will next play host to Fairhaven on Tuesday at 11:00AM. Franklin, 13 @ Attleboro, 2 – Final – Franklin’s offense reached double figures for the second straight game to pick up another road win. Tyler Gomes had a pair of doubles and five RBI to lead Franklin while Jake Lyons had two hits, an RBI and a run scored, Josh Macchi had two hits, two runs and an RBI, Ryan Hodgkins had a triple and three runs scored, Steven Luttazi had a pair of hits, a pair of runs scored and an RBI and Joe Corsi scored a pair of runs. Mike Skaza got the win on the mound, tossing five innings and striking out four. Ryan Morse pitched two scoreless innings in relief for Franklin. Attleboro’s Pat Collins went 2-4 with an RBI double for the Bombardiers. Foxboro, 0 @ Canton, 12 – Final – Canton’s Kevin Powers threw a complete game shutout with four strikeouts, issuing just one walk for the win. At the plate, Powers was 3-4 with two runs scored, Joe Peccia was 1-3 with three runs scored, Mike McMahon was 3-4 with a run scored and a stolen base and sophomore Matt Casamento was 1-2 with two runs scored. King Philip, 2 @ Mansfield, 0 – Final (9 inn.) – Senior Jon Rolfe picked up the win with a complete game shutout, allowing just five hits. Rolfe had 82 total pitches – 62 for strikes – in an efficient outing that saw him strike out three batters. In the top of the ninth, Stephan MacMean’s leadoff double to turned into a run when junior Will Weir singled him home. Three straight singles from Rolfe, senior Jack DiCenso and senior Jake Cavanagh plated pinch runner Rich Lucente for the Warriors’ second run. 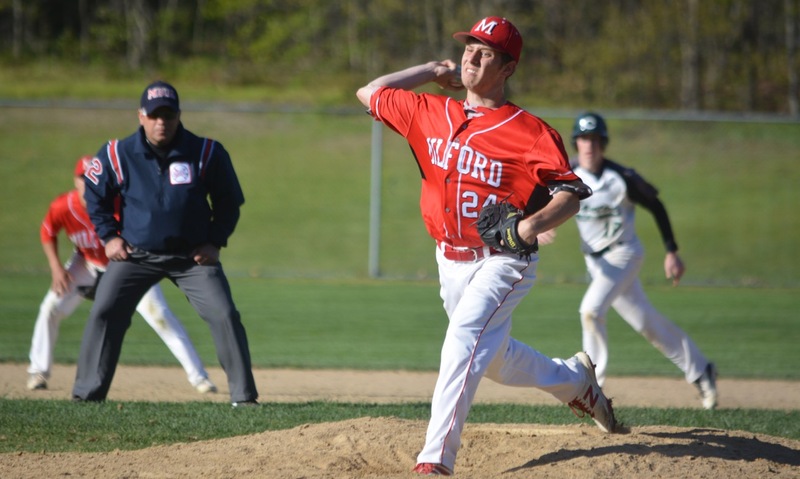 Milford, 7 @ Sharon, 1 – Final – Sophomore Aidan Wilde struck out six in five innings of no hit baseball to get the win on the mound for the Scarlet Hawks. Chris Speroni was 2-3 with three stolen bases and two runs scored while Blake Hill had a triple and two RBI. North Attleboro, 8 @ Taunton, 2 – Final – North Attleboro’s John O’Donnell scattered five hits and one walk over seven innings of work, striking out five to pick up the win for the Rocketeers. North Attleboro erased a deficit with a four run fourth inning to get the lead including a pair of runs coming off suicide squeezes. Zach Rofino was 2-5 with two RBI, Kyle McCarthy was 2-4 with a pair of RBI, Ethan Hebard added a pair of hits, Bryan Harris had a hat and two sacrifices and Ridge Olsen finished with two hits. North Attleboro amassed 12 hits as a team. Taunton’s Max Bowden had two hits and an RBI for the Tigers. Stoughton, 9 @ Oliver Ames, 1 – Final – Stoughton scored eight runs with two outs in the top of the fifth inning. Canton, 5 @ Foxboro, 10 – Final – Foxboro scored six runs in the sixth inning to earn its first win of the season. Emma Rohan struck out seven and walked just three to earn the win in the circle for Foxboro. At the plate, Marylou Long went 3-3 and Chelsea Gibbons had a pair of hits in the big sixth inning for the Warriors. Mansfield, 0 @ King Philip, 9 – Final – Kali Magane struck out 15 batters and threw her first no hitter of the season for the Warriors. Offensively, King Philip had 14 hits as a team led by Jenn Hutnyan’s three hits and a fourth inning grand slam. Christa Wagner had three hits, including a double and a triple, and Ashley Hession had two hits. Sharon, 0 @ Milford, 15 – Final (5 inn.) – Milford’s Kaitlyn DeCapua was 3-3 with a pair of runs knocked in and a home run in the first inning that was the highlight of a 10-run inning for the Scarlet Hawks. Sophomore Emily Piergustavo was 3-3 at the plate, driving in four runs and scoring a pair herself and Maggie Farrell added a pair of hits and knocked in four runs. Kelley Reichert struck out four, allowing just one hit, in five innings of work to earn the win. Taunton, 9 @ North Attleboro, 0 – Final – Taunton’s Aimee Kistner threw her second consecutive no hitter, this time striking out 10 while scattering three walks. Sophomore Kya Enos went 4-4 with a double and an RBI, Jordan Wade had three hits with two RBI and a double, Meg Navarro had two hits and an RBI and Jaime Brown went 2-3 with a double and two RBI. Bailey Clapp and Sarah Bagge each added two hits and Rebekah Lajoie had a pinch hit two run home run for the Tigers. Stoughton, 3 @ Oliver Ames, 4 – Final – OA’s Lexie Campbell’s complete game effort, with just two earned runs allowed, helped the Tigers pick up a win. Jamie Gottwald went 3-3 at the play, knocking in a pair of runs and Rachel Han was 1-3 with an RBI and a run scored. Lizzie Miller also had an RBI and a run scored while Victoria Ziner and Caroline Mahoney each added hits for Oliver Ames. Stoughton’s Nicole Bodette, Jordan Lyons and Karly Estramerea all had two hits for the Black Knights. Mansfield, 14 @ Attleboro, 2 – Final – Ryan Smith led a balanced attack with a game-high four goals while Sam O’Connell and Connor Finerty each added three goals and Joe Cox and Billy Grant chipped in with two goals apiece. King Philip, 10 @ Canton, 4 – Final – King Philip started strong, building a 5-1 lead after the first quarter but didn’t put the game away until adding four goals in the fourth quarter. Sam Agricola led the offense with four goals and one assist and senior Steven Eaton led the defense with 10 groundballs. John DeLuca and Harrison Fallon each scored a pair of goals and Tim Watson added two more with an assist. Oliver Ames, 3 @ Foxboro, 12 – Final – Louis Piccolo scored four goals and Colin Spinney netted a hat trick to lead the offense for the Warriors. Connor McNamara added a goal and three assists and Brendan Tully found the back of the net twice and had one assist. Pat Kaveny had five groundballs for Foxboro. Franklin, 18 @ Sharon, 4 – Final – The teams finished level (3-3) at the end of the first quarter but Franklin won the second quarter 6-0 and the second half 9-1 to get the win. Freshman Jacob Alexander dominated the faceoff X, winning 24/26 draws while sophomore Eric Civetti tied a team record with eight goals in the game. Senior Austin Kent added four goals and three assists and sophomore goalie Connor O’Rourke made seven saves in net. Head coach Lou Verrochi credited the defense of Sean Lockhart, Matt Pleshaw, Wyatt Arsenault and Patrick Morrison for limited the Eagles after the first quarter. Milford, 4 @ North Attleboro, 16 – Final – Sophomore Colin Young scored four goals to lead the Rocketeers. Sharon, 3 @ Franklin, 17 – Final – Julia Jette scored a team-high four goals, including her 100th career goal, and added two assists to lead the Panthers. Grace MacCallum had a pair of goals and four draw controls and Olivia Truenow had two groundballs and played well on defense according to head coach Kristin Igoe. Franklin, 5 @ Attleboro, 0 – Final – Franklin’s Rahul Herur and Eli Brooks picked up 6-1, 6-1 wins at first and second singles respectively to lead the Panthers. Tom Mancini won 6-2, 6-1 at third singles for Franklin, James Johnston and Cam Piana won 6-1, 6-0 at first doubles and Jeremy Gan and Dan Barrow won 6-1, 6-2 at second doubles for the Panthers. King Philip, 5 @ Mansfield, 0 – Final – King Philip sophomore Cole Ginter rallied for a 3-6 7-5, 1-0 (11-9) at first singles to lead the Warriors. Garrett Schneider won 6-2, 6-3 at second singles and Blake Ginter won 6-1, 6-1 at third singles. Ryan Gemelli and Sam Colella won 6-3, 6-2 at first doubles and Justin Rohan and Jake Webster won 6-3, 6-0 at second doubles for KP. North Attleboro, 5 @ Taunton, 0 – Final – Rallies at both first and second singles anchored the Rocketeers to a win. Mitchell Dyer rallied for a 4-6, 7-5, 1-0 (10-5) win at first singles and Barsomo Nuay won 6-7, 6-3, 1-0 (10-5). North junior Zack Pfeffer won 6-0, 6-0 at third singles, Jeff Yao and Nick Lockavitch won 6-3, 6-4 at first doubles and Jake Fontes and Daniel Zhang won 6-1, 6-0 at second doubles. Oliver Ames, 5 @ Stoughton, 0 – Final – Oliver Ames won each singles match in straight sets to pick up its first win of the season. Thomas O’Leary won 6-1, 6-0 at first singles, Greg Weinstein won 6-1, 6-4 at second singles and Jarrod Hedlund won 6-0, 6-1 at third singles. Attleboro, 0 @ Franklin, 5 – Final – Franklin didn’t lose a game at first or second singles as well as first doubles to get the win. Hannah Sweeney and Anna Humphreys won 6-0, 6-0 at first and second singles respectively while junior Anja Deric and senior Katelyn Davenport won with the same score at first doubles. Franklin junior Madison Derby won 6-3, 2-6, 13-11 at third singles and seniors Halle Love and Selina Wu won 6-3, 6-2 at second doubles. Canton, 1 @ Foxboro, 4 – Final – Diana Prinos, Sophia Prinos and Lexi Nelson all won in straight sets without losing a game in singles play to lead the Warriors. Michaela McCarthy and Diana Hickox won 6-2, 6-2 at second doubles for Foxboro. Canton’s Tiffany Ha and Sarah MacQuarrie won 6-2, 6-4 at first doubles. Mansfield, 2 @ King Philip, 3 – Final – The Warriors swept doubles play and got a win at third singles to edge out the Hornets. Kelly Masse’s and Megan Davenport’s marathon 7-6, 1-6, 6-4 win at first doubles was key while Molly Citarell and Corinne Palumbo won 6-1, 6-4 at second doubles. Sophomore Megan Sepich notched a 3-6, 6-2, 6-4 comeback win at third singles for the Warriors. Mansfield’s Paulina Martin won 6-0, 6-1 at first singles and Kathleen Giffels won 6-2, 6-3 at second singles. Sharon, 5 @ Milford, 0 – Final – Sharon didn’t lose a game in singles play and lost only three games in the two doubles matches combined in the win. Lulu Yuan, Nupur Shulka and Emily Wen all won 6-0, 6-0 at first, second and third singles respectively. Pooja Puttigampala and Michal Kondratiev teamed up for a 6-0, 6-3 win at first doubles and Katie Merpot and Sydney Gordon won 6-0, 6-0 at second doubles. Stoughton, 1 @ Oliver Ames, 4 – Final – Oliver Ames swept singles play and got a win at first doubles to pick up the victory. Riley Spillane won 6-2, 6-2 at first singles, Jackie Sulkala won 6-2, 6-3 at second singles and Sarah Leger won 6-0, 6-3 at third singles. Lark Warner and Olivia Groebe rallied to win 2-6, 6-1, 6-4 at first doubles for OA. Stoughton’s Becca Lawson and Ellie Kashian won 6-4, 4-6, 6-4 at second doubles for the Black Knights. Taunton, 1 vs. Barnstable 3 – Final – Taunton fell behind 2-0 in close, won the third game but Barnstable won the fourth game to win the match. Set scores were 23-25, 23-25, 25-13, 14-25. Ricardo DaFonseca had 43 assists and 11 digs along with a block and an ace for the Tigers. Sophomore Lance Law had 22 kills, eight digs and an ace, Collin Hunter played well with 11 kills and a block and Nate Grant was strong in the back row with 16 digs. The Bulldogs graduated a handful of key pieces from last year’s team that reached the playoffs but they also return plenty of experienced players and hope to reach the playoffs again. Canton has 11 seniors on the roster this season led by captains Griffin Jerrier and Joe Peccia. Jerrier has plenty of experience on the bump while Peccia was second on the team last year with a .393 batting average. The Bulldogs also have their top batter back in Kevin Powers, who batted over .400 last year and drove in 15 runs in the season. Powers was also one of Canton’s top pitchers after logging over 40 innings in 2015. Scott also brings back Jim Jenkins, Mike McMahon, Sean Doyle and Joe Bires, all which have starting experience. Junior Jackson Maffeo, fresh off a tremendous season on the ice, is expected to contribute in his first season on varsity. After just four wins last year, the Warriors look poised to improve on that this year. Foxboro graduated just two seniors year last and have seven starters back for 2016. Justin Garcia will lead a strong group of experienced pitchers. Garcia had a 1.54 ERA last season, striking out nearly 50 batters to rank near the top of the league. Colin Thoener, Darren Kelly and Aaron Wentling will also all see time on the mound this season. Chad Bearce will likely handle first base while Garcia is on the mound while Darren Kelly and John Cronin will see time up the middle. Thoener will show off his defensive prowess at third and senior Nick Wright will return for his third season patrolling centerfield for Foxboro. AJ Cavossa, AJ Bubencik and Cam Feldman will all split the other outfield time and Jesse Galanti is back behind the plate for the third consecutive season. After just getting into the postseason last year, Milford has key pieces back in key positions to try and keep their playoff streak alive. One big reason that Milford has a shot at getting back there is sophomore Aidan Wilde, who led the league as a freshman in batting last year. He hit had 36 hits and hit .537 with 21 RBI and was selected as the HockomockSports.com Underclassman of the Year. Junior Blake Hill has batted .360 over the past two years and will also be a key part of the Scarlet Hawks pitching staff. Junior Alex Macek will be one of the more experienced pitchers in the Davenport and will be relied upon as Milford tries to replace Griffin Lynch and Alex Croteau. Brian Ireland, who also is the starting third baseman, will also get innings for Milford this season. Losing arguably the two top players in the league will be tough for Oliver Ames but the Tigers have been the class of the league in recent years and have reloaded year after year. Oliver Ames has won six straight league titles but this season might be the biggest challenge. Hockomock MVP and HockomockSports.com Player of the Year Brendan Welch is off at SNHU now and Mike Ferrara, who set the single season hit record for the Tigers, is out at Worcester State. However, Leo Duggan has infielder Chris Romero back to lead OA after batting .474 last year, good for fourth in the league. Romero gets it done at the plate, in the field and on the bases – stealing 18 bases last year. Romero will be joined by Josh Minuskin, who saw time all over the field last year and will settle in behind the plate in 2016. Ryan Adams will be another key piece, playing in 18 games last year and batting .404 with 10 RBI. Sophomore Matt Muir also returns after a standout freshman year. Sam Burr, Kevin Geary, Mitchell Goulet and Nick Zwerle should all see some innings on the mound this season. For the first time in nearly a half a century, there will be a new head coach for the Sharon Eagles baseball team. After 44 years at the helm, Joel Peckham retired after last season and assistant Kee Arguimbau has taken the reigns. Senior Isaac Miley will be a leader that Arguimbau will rely on all over the place. He’s been on varsity since his sophomore year and is returns as the starting shortstop this season and will be one of the program’s top pitchers. Senior Mark Botaish will also see a lot of time on the mound and will man third base when he’s not pitching. Arguimbau noted Botaish’s strong junior season and is hoping that will be built on this year. Andrew Filipkowski is back in the outfield for his third season and will be relied upon to get the offense started from the leadoff spot. Junior Jake Marglous is back at catcher again this season and classmate Aiden Arnold is back to man first base. Arnold was also one of the Eagles’ top hitters last season and will help pace the offense this year. Arguimbau also expect contributions from Rob Bayha, Mike Dumont, Jordan Chabot, Ryan Crooks and Spencer Singer. The Black Knights came up just short of the postseason last year but return a strong core and are poised to punch their ticket to the playoffs in 2016. “With a mix of experience and youth, we are looking to field a competitive team this season that should be able to compete with anybody,” head coach Mike Armour said. Jake Gibbs has been one of the top players in the league the last two seasons and will look to do the same during his senior year behind the plate. Junior Ryan Sullivan showed a lot on the mound last season and will see a lot of innings along with juniors Justin Hutchinson and Nico Parmeggiani and senior Barry Cooke. Armour is looking for Doug Seaman to take on an expanded role during his senior season after being limited to just hitting last season. Junior Jack Connelly will man first base for the Black Knights while Joe Piana will see time at third base. Expect Chris McNulty, Nick Quattrucci, Matt Gallagher, Luke Johnson, Michael Batte to all see time in the field while Jared Maher will log some innings on the mound.